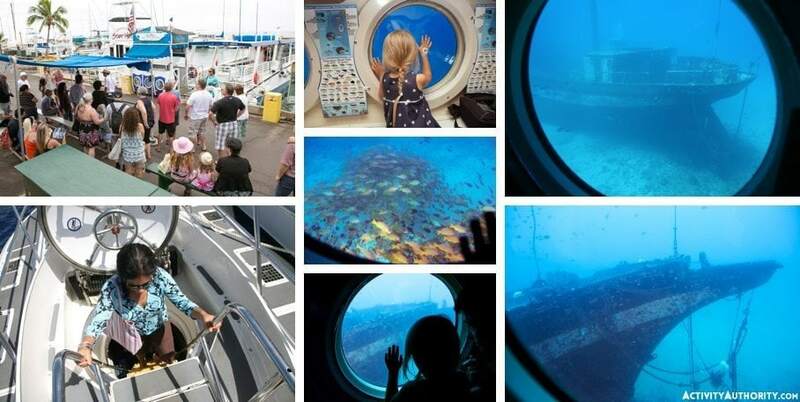 If you love the idea of exploring Maui’s underwater world without actually having to get wet, we encourage you to check out the views from a Maui Submarine! Located conveniently off the shores of West Maui, guests will take a quick boat ride from Lahaina Harbor to arrive at the submarine before descending to depths of 100+ feet below the surface. Enjoy fun commentary from entertaining and knowledgable guides, as well as stunning views of the Carthaginian replica shipwreck, its artificial reef and surrounding marine life, and maybe even scuba divers! This is a perfect half-day activity for the whole family. With 6 daily departure times and a tour time of just under 2 hours, this exciting and unique Maui activity is ideal for travelers seeking a fun way to explore the ocean without committing to a full day on the water. While all guests must be 36 inches or taller and physically able to climb down a nearly vertical 10-step ladder to get in and out of the submarine, the ride is extremely relaxing, entertaining, fascinating and family-friendly. Each tour departs directly from Lahaina Harbor, where you’ll board a shuttle boat for a quick ride to the submarine site. Watch as it ascends to the surface, and simply climb in for your adventure to begin! With a limit of 48 passengers, your Maui submarine tour also includes air-conditioning, comfortable seating and great commentary by staff members. Featured in National Geographic, this Maui submarine Tour is also one of only a few local tour companies to be recognized for its eco-tourism efforts. Descend to over 100 feet below the ocean’s surface, and see the artificial reef created by the sinking of the Carthaginian shipwreck replica, as well as an amazing assortment of tropical fish and local marine life. In winter months, guests on Maui submarine tours will also likely be treated to whale watching on the ride to and from the harbor!